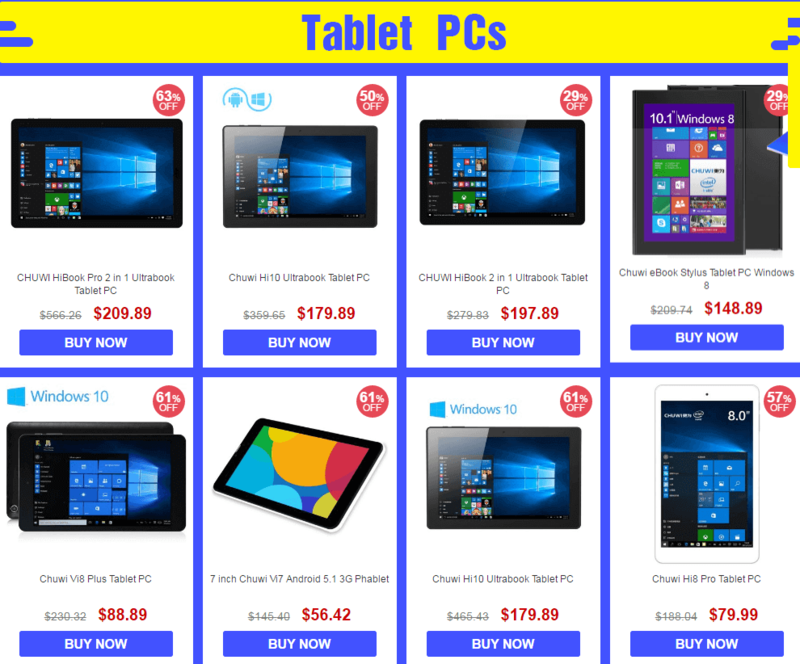 The latest Chuwi Tablet Brand Sale on Gearbest is of the wide range of tablets from the company Chuwi. 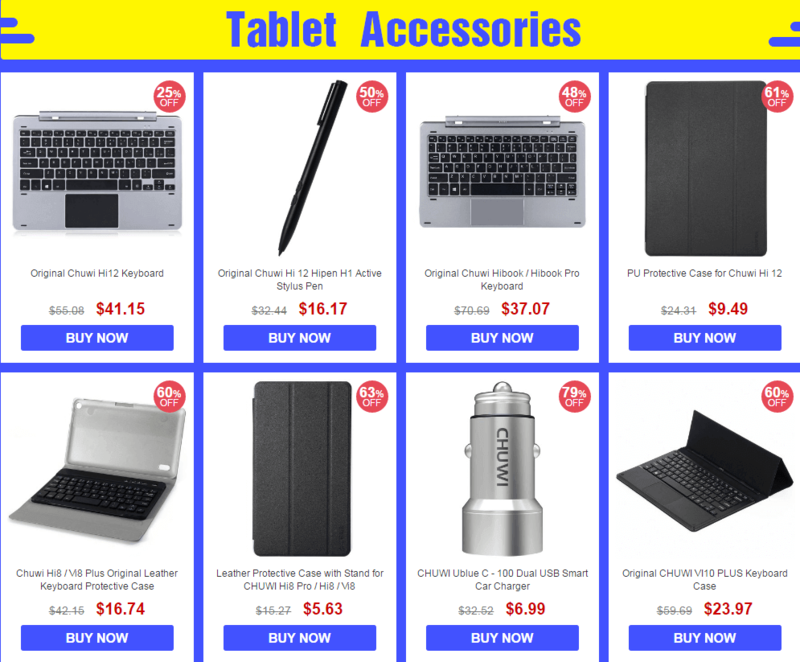 The sale is from Aug 15th to Aug 22nd and you can purchase products at really low prices (more than 50% off) after getting huge discounts. 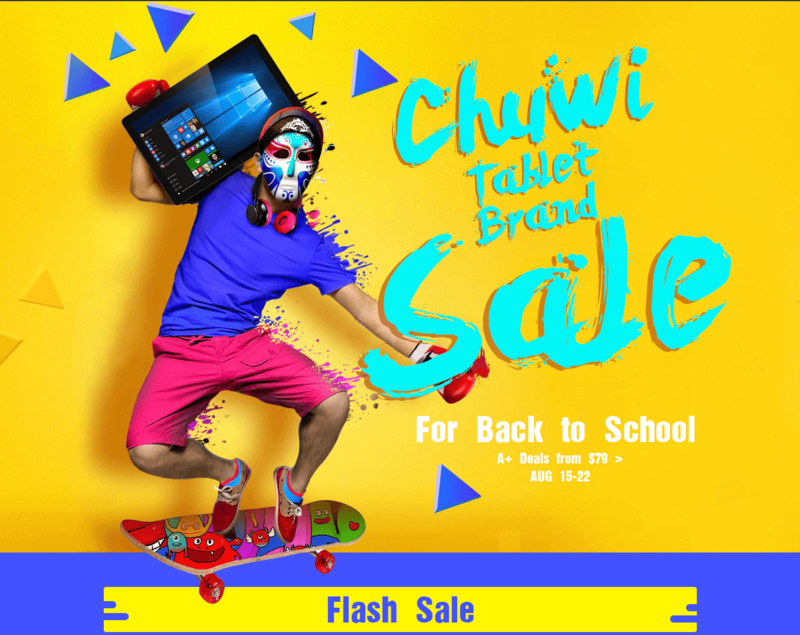 As you can observe, the sale is related to tablets so everything related to tablets can be bought, it can be a brand new tablet or tablet PC or even an accessory related to tablets.Below we have shared the products details which are on Chuwi Tablet Brand Sale. world class performance on all fronts. It comes with the CPU Processor Intel Cherry Trail Z8300 64 bit Quad Core 1.44GHz. It can be expanded up to 1.84GHz to give better performance. It has 2 GB RAM and a 32 GB ROM storage capacity which can be expanded to 128 GB using TF card. Its HD Graphic Gen8 processor makes it a better and faster device for gaming purpose of users. It has a unique feature of dual OS; you can either run it on Windows 10 or on Android 5.1 Marshmallow. Its 8.0 inch screen provides a unique experience for watching movies or playing games. Its 4000mAh battery lets the user use the device for a longer period of time as compared to other phones or tablets. Its other features include Bluetooth, Wi-Fi, OTG, gravity sensor, HDMI output for connecting to TV screen, E-Book and more. 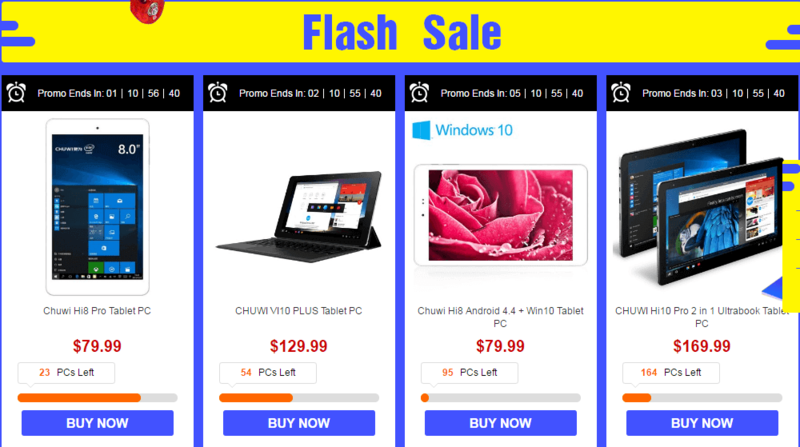 This phablet’s normal price is $188.04 but in this special sale you can purchase it for just $95.89 but you need to do it quickly as only 60 pieces are left as of now. Chuwi’s VI10 Plus comes with a vivid 10.8 IPS touch screen with a resolution of 1920 x 1280 full HD and adaptive technology which will surely bring all the images and videos to life. Its processor Intel Cherry Trail Z8300 64bit Quad Core 1.4GHz makes this device really easy to navigate and gives it a smooth and lag-free performance. Intel’s Turbo Boost technology also delivers extra power to this device when it needs it. It has 2 GB RAM which helps all your apps to run smoothly without hanging as well as in using multiple programs at once and a 32 GB ROM storage capacity to save images, music, videos etc. The ROM storage capacity can be expanded up to 128 GB using TF card. By default this device runs on Remix OS 2.0 but after rooting the device you can run it on either Windows 10 OS or on Android 5.1 Marshmallow OS. Normally this product is available at $298.08 but in this sale you can get it for as low as $129.99 only. This amazing product is equipped with a 10.1 inch IPS touch screen with a resolution of 1920 x 1200 pixels with an aspect ratio of 16:9. 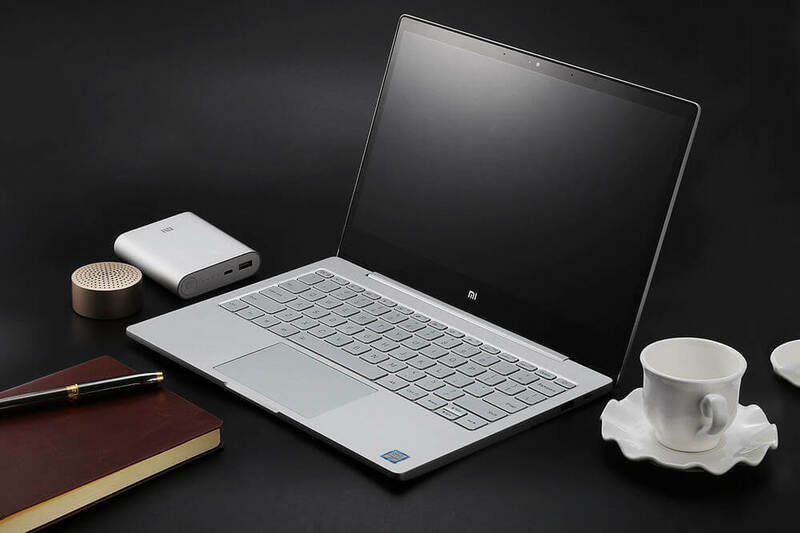 It is a dual OS supporting device and allows the user to use both Android 5.1 OS as well as Windows 10 OS depending on their needs.It runs on the latest fifth generation Intel Cherry Trail Atom Z8300 64bit quad core 1.44GHz processor and gives an impressive performance and high efficiency. It comes with 4 GB RAM which when coupled with eighth-generation Intel HD Graphics enables the user to have an incredible viewing experience. It also has a 64 GB ROM storage capacity which can be expanded to 128 GB using TF card expansion. Normally this product is priced at $481.10 but only in this sale you can buy it for $169.99 and hurry up as only a few pieces are left.